Lipton Tea has been around since 1893, when Thomas J Lipton opened a tea packing company in Hoboken, New Jersey. After years of producing Lipton tea bags, they added bottled iced green tea to their product mix. At first glance, you may assume that because it is green tea, it must be healthy, but after reading the list of ingredients, you’ll see it’s no better than a can of soda. Lipton Green Tea with Citrus comes in a 20 fl. oz. bottle. Its list of ingredients reads: Water, High Fructose Corn Syrup, Citric Acid, Green Tea, Sodium Hexametaphosphate and Ascorbic Acid (to protect flavor), Honey, Natural Flavors, Phosphoric Acid, Sodium Benzoate, and Potassium Sorbate (to preserve freshness), Calcium Disodium EDTA (to protect flavor), Caramel Color, Yellow 5, Blue 1. Keep in mind that each 20 oz. bottle represents 2.5 servings. There are 80 calories per serving, or 200 per bottle, including 21 g of sugar per serving, or a whopping 52.5 grams of sugar per bottle. That equals over 11 teaspoons of sugar per bottle. 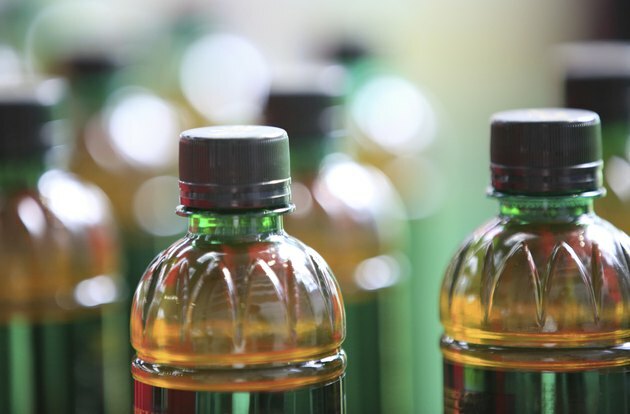 Not only does Lipton Green Tea come packed with sugar and calories, it also has high fructose corn syrup as its second ingredient--green tea is fourth on the list. When you consume high fructose corn syrup it is quickly absorbed by the liver and converted into fat. Your body doesn't even recognize it as food, so you’re still hungry, if not hungrier after you consume it. According to Dr. Oz, “throw out all products that contain high fructose corn syrup”. Lipton Diet Green Tea with Citrus also comes in a 20 oz. bottle, but has no calories. The ingredients are basically the same, except the diet product uses aspartame for sweetness, rather than high fructose corn syrup and honey. Even though aspartame has no calories, this does not make it a healthy alternative. Eighty percent of the consumer complaints received each year by the FDA involve aspartame. The FDA has recognized the link between aspartame poisoning and 92 symptoms, which includes headaches, vision loss including blindness, seizures, neurological problems, cardiovascular problems and death. The Lipton website boasts that their bottle of Diet Green Tea with Citrus has 72 mg protective antioxidants per 8 fl. oz. serving or 108 mg per 12 fl. oz. serving. In comparison, the Lipton Green Tea with Citrus tea bag has 110 mg of antioxidants per serving. Green tea is loaded with antioxidants, but processing destroys some of them. Tea bags have more antioxidants per serving than the bottled version. Loose leaf green tea has even more antioxidants than tea bags. The new bottles being used by Lipton now contain 20 percent less plastic than the old ones, helping to reduce their impact on the environment. As the world’s leading tea producer, Lipton is committed to sustainable practices. Their tea estate in Kericho, Kenya has been Rainforest Alliance Certified™ and they anticipate that “by 2015, all Lipton tea bags sold globally will have been grown on Rainforest Alliance Certified™ estates,” according to their website.